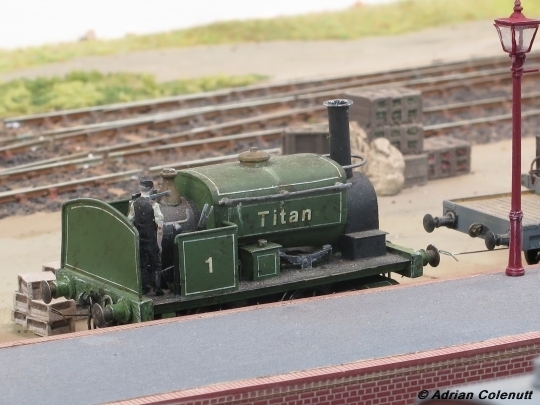 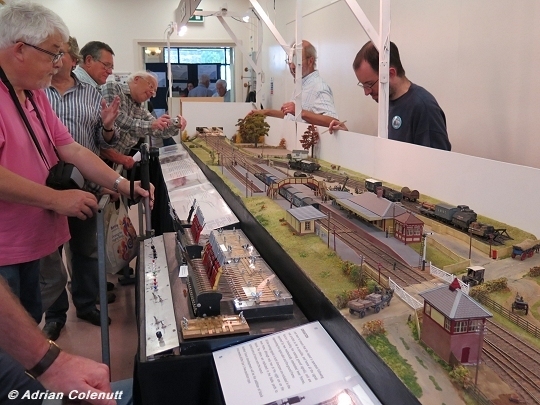 A selection of photos from the Uckfield 2014 show, taken by Adrian Colenutt. 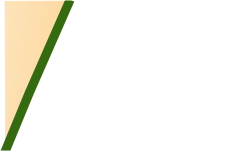 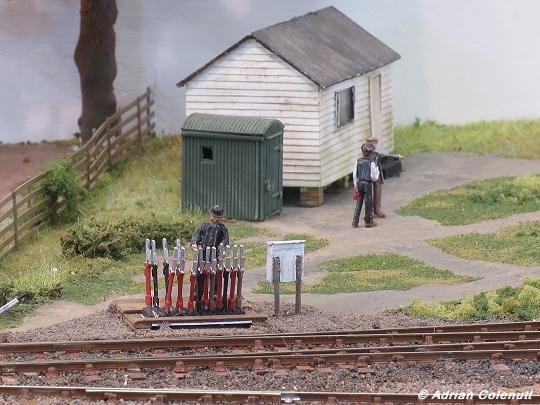 Left - a general view of the complete layout - signalman at the front, and drivers-fiddle yard operators at the back of the layout. 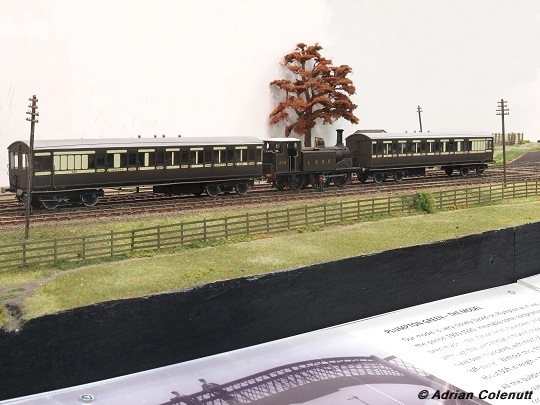 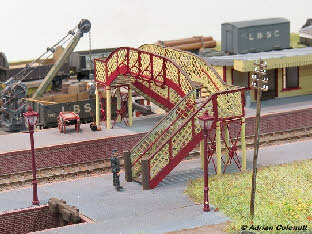 Right - a few details of the platform, including the footbridge, a Churchward models kit. Left - D3 ‘Victoria’ in Stroudley’s passenger livery pulls into Plumpton from Lewes. The signal box on the platform has now been replaced with a ‘correct’ model of the real thing (the original box downgraded to a lamp-room in 1891). Right - a heavily weathered, scratchbuilt E1 ‘Strasbourg’, in Stroudley’s goods green livery, with a (working) ground signal to the left. 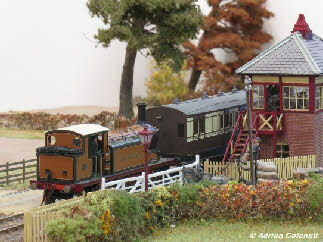 Right - another E1, this time in the later Billinton lined black goods livery, approaching the boarded foot crossing. 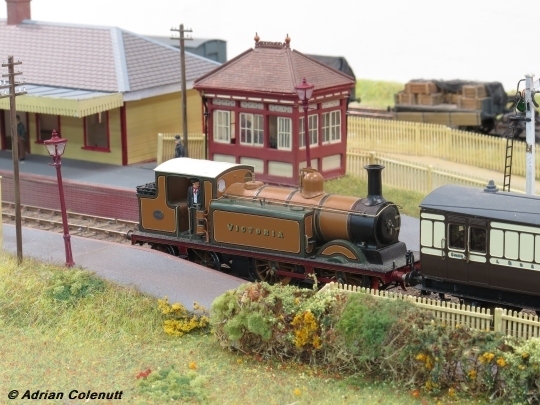 Left - ‘Victoria’ again, heading for London, passing the ‘new’ 1891 signal cabin, and the crossing gates. 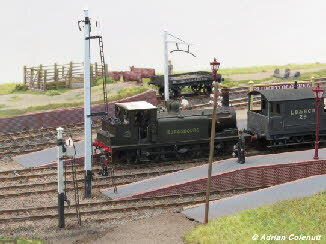 Right - and again, awaiting the up platform starter. 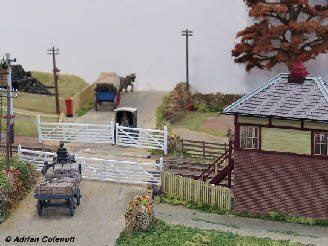 Left - the signal cabin and crossing gates - due to be replaced and mechanised during 2016. Right - the two-coach motor train, with 0-4-2 D1 in the middle, en-route from Horsted Keynes to Seaford via Haywards Heath and Plumpton. 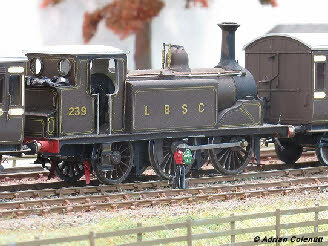 Left - a close-up of scratch-built D1 no 239. Right - E1 (formerly ‘Calvados’) passing the signal box, heading for Lewes. 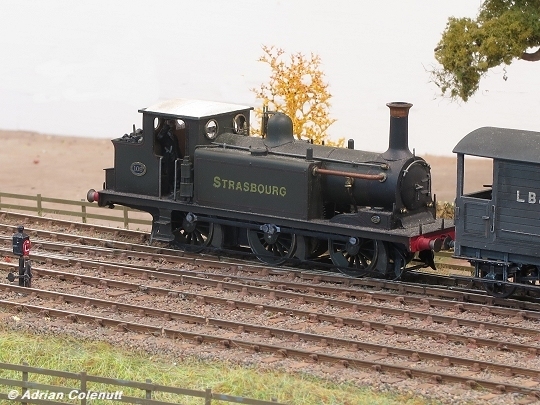 Left - E1 ‘Strasbourg’ preparing to shunt the yard. 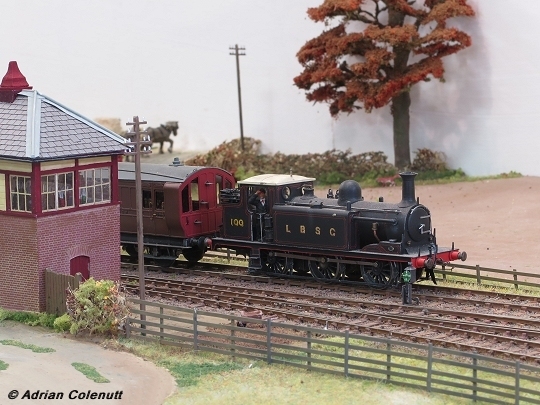 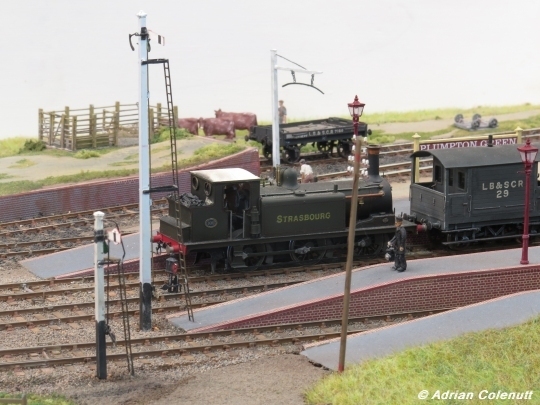 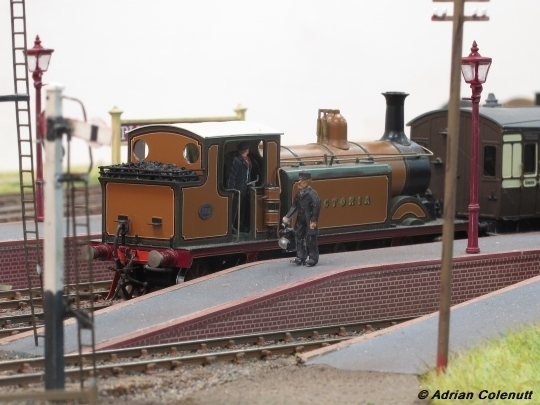 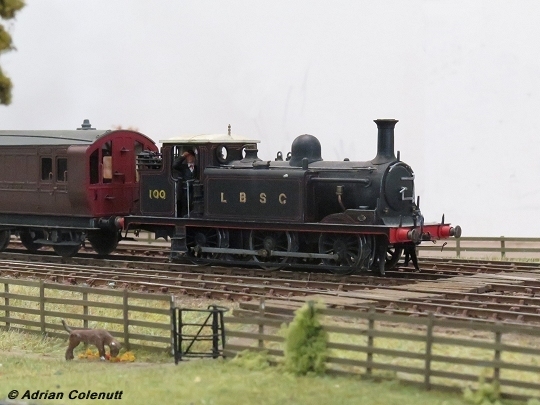 Right - scratchbuilt Manning-Wardle bringing goods into Plumpton from the brickworks.